It was about four in the afternoon on Thursday, and I was playing outside with my three-year old son, Joel. We were pelting each other with water balloons (it was like 100 degrees out...) when Joel picked up a stick -- and quite unknowingly -- began brandishing it as though it were a sword. I picked up a stick too, and before we knew it, we were locked in a fast-moving sword fight of epic proportions...up and down my drive-way. When Kathryn arrived home from work at about 5:00 pm, that's precisely how she found the two of us: Joel had a "sword" clutched in each hand, and was fearlessly attacking me -- whirling about -- while I cowered in a defensive posture, parrying his lunges. In that moment, I was transported back to my own distant childhood in the 1970s. I experienced a flood of memories from favorite films; ones I hadn't thought about in a very, very long time. And naturally, of course, I thought of Star Wars. George Lucas was extremely clever in the way he crafted a sci-fi variation of the swashbuckling sword -- the "light saber" -- for his new cinematic universe. The 1970s was definitively the era of gun-toting, silver-screen anti-heroes like Dirty Harry (Clint Eastwood) and Kojak (Telly Savalas). Accordingly, in Star Wars, swords (er...light sabers) were explicitly positioned as being "an elegant weapon for a more civilized time." Funny, that's precisely what Star Wars was too: a throwback to another, more romantic era of Hollywood history, before anti-heroes became all the rage. Think Errol Flynn's The Adventures of Robin Hood (1938) for instance. Touche, George, touche. So anyway, I began to consider how, as a kid, many of my favorite fantasy/sci-fi movies involved sword-play in one mode or another. And then I realized that sword fighting had to absolutely be the geek equivalent to a sports obsession. I mean, just watch the amazing fight between Robin Hood and Sir Guy in that 1938 film (on a winding staircase, no less...), and you can see how the action is all about dexterity, speed, and physical grace. It's fascinating. It's a recognition of physical prowess, skill, athleticism and training... only cloaked in romantic, fantasy, and dramatic trappings. This fight is available on YouTube, but the embed is disabled...so seek it out if you haven't seen it. Now look at how the cinematic sword fight standards are re-parsed in a more modern film like The Princess Bride (1987). There, the battle between two evenly-matched opponents is an opportunity not just for physical dexterity and speed....but for razor wit as well. Yep, the sword-fight is definitively the thinking man's sports addiction. Remember the Star Wars Kid, who in a (not-so) secret moment, picked up a light saber and just went nuts...expressing his inner geek? Well, that kid took a lot of mean-spirited ribbing, but I truly believe each and everyone of us who grew up with Star Wars (and also with sword-fights on film) understands the "force" that was driving that kid to move...to take up the sword-play. It's not a violent impulse or anything. But to pick up a sword and lunge at your enemy...well, it's empowering, somehow. To know that all of your body is in tune -- a perfectly calibrated instrument -- and that you are moving with grace and purpose and determination; that your brain is reacting and acting with lightning fast-agility to each new challenge....it certainly beats the hell out of jogging. And watching Joel yesterday, I think this love of the sword fight is genetic. So today -- on a lazy summer day when I'm feeling slack -- I've assembled below some of my favorite cinematic sword fights to spark your own memories. I'm sure I've left quite a few battles out (I couldn't find Ash's on-the-rampart battle from Army of Darkness, alas...), but these were the ones that popped to mind. The one in Jason and the Argonauts still dazzles me: it's a meticulously-constructed, perfectly edited combination of solid film techniques. I love how it doesn't rely on quick cuts or close-shots or a jerky camera to depict the special-effects-heavy action. Instead, exhilaration comes from watching the movements, the choreography; from the sense of escalation and tension of seeing the main characters in jeopardy. And I know people dislike The Phantom Menace (1999), but this sword duel between two Jedi and a Sith Apprentice must be one of the most dazzling in genre film history. Lucas may have gotten other things wrong, (Jar-Jar) but he certainly got this sword-play right. He's aided in no small part, I should add, by the scoring of John Williams...which still gets the blood pumping. Anyway, here we go. If you can, watch the clips in their entirety, so you get the feel of the building momentum before each fight commences. After you're done watching, take your kids (if you got 'em) for a sword fight in the drive way. As well, that is a spectacular selection of sword fight sequences (mentioned and shown) -- those Ray Harryhausen ones really show off the genius of the man. Sword fighting in film really is its own art-form. One that involves dexterity, skill, and brains (in front and behind the camera). The best of those (you covered a good number of them, here) get that across to the audience with their coordination in sword choreographing, acting, and cinematography. I'm very happy you gave props to the Duel of the Fates sequence in PHANTOM MENACE, too. Yes, it's a problematic film by Lucas, but stunt coordinator Nick Gillard's sword fight sequence is definitely not (and is THE highlight of the film). If you're interested, an absorbing series of blog posts on film sword-fights was done in 2006, 2008. It was written by journalist/writer Steven Hart. It's well worth reading (Part 1, 2, 3). This was one special post, my friend. Thanks for this. Oh man, did you tug on this zombies sinewy heart when you brought up the Sinbad movies, especially that sword fight with kali! That was my favorite scene of all the films! 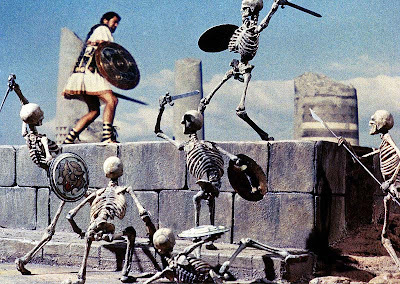 I am such a nut for stop-motion animation..everything from Harryhausen to Rankin/Bass. I would have to rank this as one of my top ten sword fights, along with the one from The Princess Bride, the two skeleton sword fights from the Sinbad films, the Darth Maul one from Episode 1, then I would add Obi-Wan vs Anakin in Episode 3, Conner MacLeod vs Duncan MacLeod in Highlander: Endgame, Robert Roy MacGregor vs Archibald Cunningham in 95's Rob Roy, Valeria vs Thulsa Dooms henchmen in Conan, and basically any fight between Blade and the Vampires. Thanks for posting that vid of Sinbad vs Kali...haven't seen that in forever! Le0pard13: I love the way you described this special moment, an "engram." That's right (and cleverly put). It's like...forever imprinted on my brain. I've had so many of those "Engram" moments with my son and wife since Joel was born. I don't mean this lightly or flippantly, but I hope when my time comes...this is the sort of imagery that flashes before my eyes. Pure happiness and joy. It's also good to know that I'm not alone in my appreciation of Phantom Menace's climactic fight. I am going to check out those links, so I can find out more about it. Trick or Treat Pete: Glad I tugged at your "sinewy heart" (I love that...) with this post. 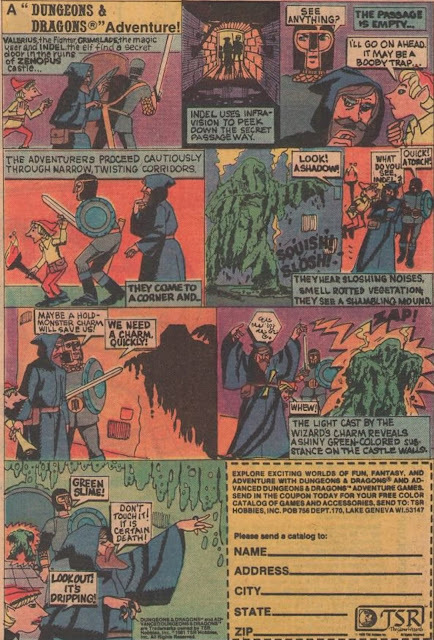 I tried to post some Highlander sword fights here, but embedding was disabled on the best of 'em, so I'm glad that you brought them up so other readers can seek them out. Highlander seems to be the latest and most popular iteration of sword-fighting in the genre. Great topic. Interesting that Harryahausen figures so prominently in the subject matter and the clips. I would only add that Bernard Hermann's score helps accentuate the action on Jason and Seventh Voyage. It all comes together to make for a fantasy and action spectacle. Thank you my friend. And a HUGE Thank you for mentioning Bernard Hermann...that was definitely an oversight on my part (especially because I did mention John Williams). Herrmann's scores are amazing, and add significantly to the tension/reality of these sifht scenes. I can't imagine these fights without them. What a fantastic topic to write about! I love those examples you sampled from Harryhausen's films. Those have to be some of the most memorable of all time - esp. the iconic fight with the animated skeletons which Sam Raimi paid homage to so lovingly (and hilariously) in ARMY OF DARKNESS. As someone else pointed out, the sword fights in the original HIGHLANDER film are stand-outs for me, esp. the two that bookend the film - the one in the parking garage and the finally over the Silvercup sign! Another one of my faves is CAPTAIN KRONOS - VAMPIRE HUNTER which has some pretty decent sword fights as well. J.D. : Oh crap, I did forget Captain Kronos. Well, crud. But yes, that would have been a great addition to this post. I wish I could have embedded Raimi's skeleton fight from AOD too, just to show what a great homage it really is. (And he really made Bruce Campbell work hard to pull it off, too...).